Fort Lauderdale, FL – U.S. gas prices moved slightly higher during the past week, led largely by strong price gains in key regions. The average U.S. gas price nudged higher by about two cents, according to the latest data from the U.S. Energy Information Administration. However, in regions where the price did increase, the increases were typically much higher than a couple cents. Strong declines in prices across the Rocky Mountain and across the midwestern states held the U.S. average in check. Prices surged in the lower Atlantic states and along the Gulf Coast, with moderate price increases seen in California and, more broadly, the far west coast. The highest gas prices are found on the west coast, sans California, where prices edged upward by almost five cents per gallon. With the golden state added to the mix, prices only slipped up by two cents. 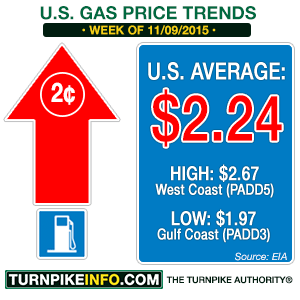 The lowest prices were still to be found on the gulf coast, but prices in that survey district, too, jumped during the past week, climbing almost six cents per gallon. Prices by region are as follows, ranked highest to lowest.